What if we use sound to see with? My posts usually discuss an exhibition or a museum that focuses on music themes or that innovatively displays music within a museum setting. Here, however, I want to take a slightly different tack. Although it was my visit to the Alexander Graham Bell museum in Canada that has prompted this post, my aim is rather to draw the reader’s attention to the significance of Bell’s work in the development of the sonification of our lives. Indeed, from the museum studies point of view, the Bell museum is in need of updating, which means that there is no particular approach of this museum that I would like to highlight beyond that of celebrating Bell’s extraordinary contributions to our lives and of exhibiting a collection of artifacts donated in 1955 by the Bell family. Alexander Graham Bell (1847-1922) is mostly known for his invention of the telephone in 1876. Although Scottish, Bell lived in Canada for most of his life, more specifically in Baddeck in Nova Scotia. I suppose most of us would not go to Canada expressly to visit this small unknown town but I had the good fortune (so I believe) to have been selected to present a paper at a conference in Nova Scotia, which was just one hour’s drive from the Bell museum in Baddeck, and thus was lucky to have the opportunity to visit this breath-taking place. While I was driving to the museum, I felt so astonished and awe-struck by the landscape that I clearly understood why Bell had established his summer refuge there in 1885 and, later, had settled there to continue his busy routine of experimentation and analysis. Furthermore, by the time of Bell’s arrival in Baddeck, the success of the telephone had freed him from the need to earn a living and so his imagination and wide-ranging curiosity led him to scientific experiments in such areas as sound transmission, medicine, aeronautics, marine engineering and space-frame construction. The discussion of Bell’s innovations on the technologies of sound reproduction fits perfectly with the major purpose of my posts on this webpage that of fostering the transformation from a paradigm where knowledge goes mainly hand in hand with visibility to one where sound plays its part towards an invigorated understanding of the world. However, my commitment is neither to denigrate the credentials of vision nor even to set up a conflict between sight and sound as sources of thought. I am also not endorsing the very common rationale that, because there has long been a clear emphasis on sight, we now have to call for its replacement by hearing, discussions that I believe have led to a waste of time. I am not focused on pointing out what we should not do but rather on what prospects we should try. As sight focuses specifically on one thing at a time, it promotes sequential narratives. With hearing, on the other hand, everything happens at once, which encourages an interest in essence: there is no explanation, only being. The mentality of the audible is that of the multitude, in that the interpretation of sound gives rise to a multiplicity of understandings. This goes beyond the traditional Western chronological rationales and relationships of cause and effect prompted by vision-based rationales. Ultimately, my quest is: what if we make sound the source of thought? What if we make sound the lens through which we understand the world? Let us see where a focus on sound as a rationale can lead us. What innovations might arise as a result? Although mostly known as the inventor of the telephone, Bell’s contributions to the development process of the technologies of sound reproduction were so significant and their cultural impact so meaningful in the long term that I would like to write a few lines about them. Alexander Graham Bell’s major impacts on the development of the technologies of sound reproduction were the invention of the phonautograph, patented in 1874, and the graphophone, patented in 1886, a modified version of the 1878 Edison phonograph. Now that we have sound reproduced everywhere, the idea of sound being reproduced might seem absolutely trivial and intuitive but, in fact, technologies of sound reproduction emerged through a long process made up of several moments of innovation in the pursuit of a variety of aims but never with the aim of specifically producing a device to reproduce sound. Similarly, as sound reproduction technologies came about as a result of the work of several inventors, its authorship is collective, rather than an achievement of one individual and distinguished personality. In line with this, with the invention of the phonautograph and graphophone, Bell did not envision revolutionary devices to reproduce sound, but rather machines to visually represent speech so that they could help him to teach the deaf to speak. Furthermore, these inventions went on to be commercially explored as office applications and their use as sound reproduction devices ended up being accidental, as we will see. 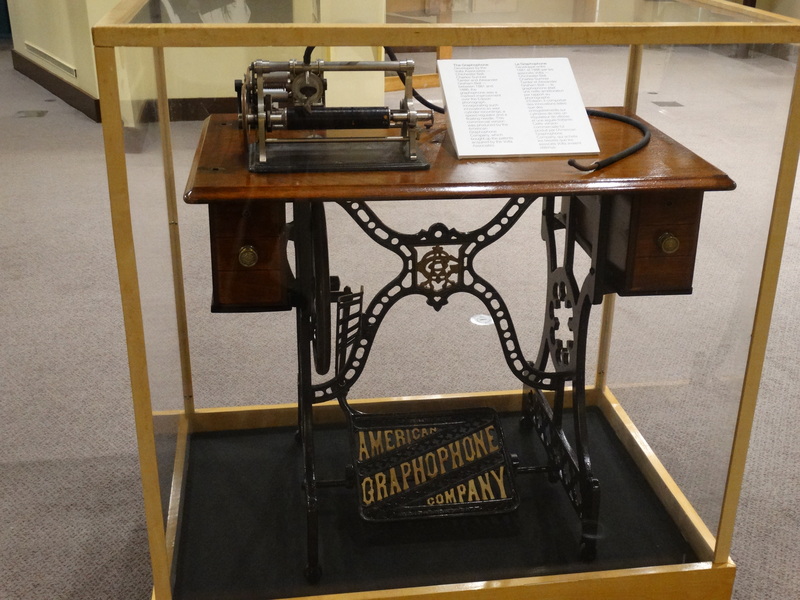 However, Bell’s graphophone, alongside Edison’s phonograph which inspired it, not only represented sound visually, but also offered the possibility for it to be reproduced. Inspired by the mechanism of the ears, the phonotaugraph and graphophone’s technologies produced tracings of the sound channeled by a mouthpiece. During the recording process, the sound vibrations were inscribed onto a cylinder by means of a stylus and these inscriptions could then be reproduced. Nevertheless, only when a coin-in-the-slot mechanism was added to Bell’s graphophone along with four pairs of headphones did it start to be widely distributed as a music box in saloons, amusement parks and retail shops, which then proceeded to stimulate a steady demand in the entertainment sector. Until this accidental, entertainment-based success, no one had made a specific and enduring effort towards developing technologies able to reproduce sound. Now assigned with a new context and function, the downside of the graphophone’s mechanism was that each cylinder had to be recorded individually and could not itself be reproduced, which meant that mass reproduction and distribution of the recording, for which there was now a demand, was not possible. This led to the next quest in the history of sound reproduction technologies, overcoming the obstacle to mass production, and to the commodification of music. Accordingly, there now emerged attempts to develop devices specifically to perform the reproduction of sound but not just to reproduce sound per se, but also to generate profit by means of mass distribution. As a consequence, in 1887, Berliner invented the Gramophone and then a flat circular disk, which for the first time made possible the mass production of sound recordings, which led to a huge and decisive watershed moment in the history of sound reproduction technologies, in that the practice of recording and playing music was established. A point of no return had been reached. The history of sound reproduction technologies that I have outlined above is a very potted version in order to fit the common features of a limited Internet post. As an introduction, it mainly follows a fairly traditional approach in which the story is told by linking a series of a few key points. Nevertheless, it is my aim to reflect on the cultural significance of such a story. I am a supporter of the idea that the recording of sound has indeed defined the whole of the 20th century and changed time paradigms, in that it can crystallise a moment, thereby giving people the opportunity to retrieve that moment whenever they wish. While I cannot stop feeling moved by the impact of such achievement on the maintenance of our species, Simon Reynolds interestingly considers this opportunity a philosophical scandal considering the ephemeral character of musical sound. Also worth noting is the idea that, by means of sound reproduction technologies, humankind started to consume music as an extension of our identity, thereby using music to get to know ourselves more deeply and to lay down enduring connections with our history. This in turn led to intense relationships with material culture, resulting in the increase of collecting habits and practices. Also worth mentioning is the understanding that the development and legitimisation of each technological device is heavily dependent on its ability to perpetuate prior practices of people. First and foremost, the forms and rationales of technologies embody human practices. For Sterne, Technologies are repeatable social, cultural, and material processes crystallized into mechanisms. Following this rationale, the success of the development of sound reproduction technologies, which are commonly understood mainly in the light of the commercial interests of the industrialised-capitalist societies that blossomed at the beginning of the 20th century, might have been a result of encompassing and achieving an underlying purpose: that of preserving sound. This might also be testified to by earlier inventors’ attempt to transcribe sound, as if sound could be written down and thus preserved. While reflecting on these issues I cannot stop imagining what our understanding of everyday life might gain and what the implications for knowledge of the world could be if we used sound to see with. McLuhan (see note 2) has put forward some original ideas about this discussion in which he considers that the advent of sound reproduction technologies such as those of radio and phonograph at the beginning of the 20th century gave new value to rationales of the sonic. Because hearing is spherical (while vision is directional) would it therefore be propitious, so to speak, to establish a relationship between this turning towards aural culture and the postmodern goal of observing plural narratives of world phenomena? Is the postmodern crisis of representation, alongside a drive to ‘deconstruct’ cultural objects so as to reveal their politics, partly a result of this increase in aural culture? Among the many other interesting discussions that intertwine with this, I would like to note one that particularly interests me. Now that, from the technical point of view, the display of sound in museum settings is not a problem any more, it is time for curators and cultural managers to expand on the untapped potential of exhibiting sound. Indeed, only through the exhibition of sound artifacts and some of their possible interpretations might visitors come to consider the specific and uncharted language of sound, together with related concepts, knowledge and meaning. The set includes memorabilia associated with Bell’s experiments, the original HD-4 hull of a hydrofoil boat that set the world speed record in 1919, and a full-scale replica of that boat, the AEA Silver Dart which in 1909 was piloted by J.A.D. MacCurdy up into the air over the ice of Baddeck Bay, becoming the first heavier-than-air craft to be flown in Canada and possibly the British Empire. Also included is material from his experiments with kites, planes and high-speed boats. In addition, the museum features displays relating to Bell’s work with the deaf and how this led to the invention of the telephone, plus many other exhibits and documents from Bell’s years of research activities on the transmission of speech and sound by wire and by light. https://en.wikipedia.org/wiki/Alexander_Graham_Bell_National_Historic_Site. Accessed on July 6th 2015. Marshall McLuhan. “Visual and Acoustic Space”. Audio Culture, Readings in Modern Culture. Eds. Christoph Cox and Daniel Warner. New York and London 2005. p. 70. Deafness seems to have played an important role in the emergence of the technologies of sound reproduction by means of its close relationship with the life of its inventors: Bell’s mother become deaf in her adult life and Bell himself married a deaf woman, which made him have a particular interest in fully including the deaf in mainstream culture. In addition, Edison was hard of hearing. In contrast with Edison’s phonograph, which recorded sound by means of producing inscriptions onto a wax cylinder, Bell’s graphophone replaced the layer of wax covering the cylinder with some tin foil, which increased both the quality of sound and, in particular, the lifetime of the recording. Simon Reynolds. Retromania. Pop Culture’s Addiction to its Own Past. London 2011. p. XXXV. Jonathan Sterne. The Audible Past, Cultural Origins of Sound Reproduction. Durham and London 2003. p. 8.